Picture this: the weather report calls for heavy rain and as soon as the first drops begin falling you take a look up at your gutters. You notice that instead of water trickling down the roof and collecting in the gutters, it’s actually dripping down behind them. Should you be concerned? Put simply, yes you should be concerned. Even if you don’t have a vast knowledge of how gutters work, you probably know that their purpose is to catch rainwater and successfully lead it away from your home. So when water drips behind them the purpose is defeated, right? Why does this happen? Sometimes, installers push the drip edge tight against the fascia board. Although this may look nice and neat, surface tension has a tendency to pull water around and cause it to drip. Why is it so bad? When water drips down behind the gutters it comes in contact with the fascia board. Moisture can cause wood to rot and it can also attract termites, both of which can wreak havoc on your home. 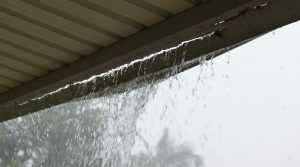 So if you find yourself watching water leak behind your gutters, call on the experts at North East Home Improvement right away. We are the experienced, local choice for gutter installation, maintenance and repair in Greenwich and the surrounding areas of Fairfield County.